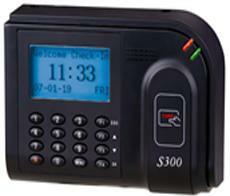 S300 is a proximity time and attendance terminal. It is based on ZEM500 platform. It offer unparalleled performance using the state of the art proximity reader and embedded Linux platform. The world famous Linux system ensures stable and reliable network transmission. TCP/IP communication is standard and make sure the data transmission between terminal and PC can be easily done within several seconds.